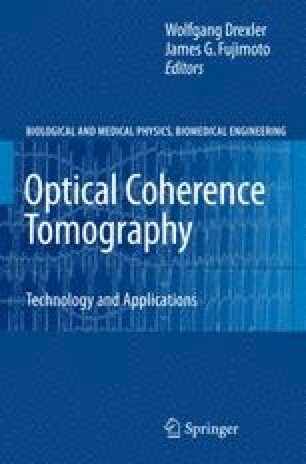 Holographic optical coherence imaging (OCI) is a wide-field depth-gated direct imaging approach that acquires en face images from a fixed depth inside scattering media without the need for computed reconstruction . A holographic real-time film (most commonly a photorefractive quantum well structure ) provides the coherent demodulation that extracts information-bearing light from the multiply-scattered statistically incoherent background. The photorefractive effect responds to the gradient in intensity, rather than to direct intensity, and records only coherent light interfering with a reference wave. The hologram is read out by diffracting a reconstruction beam into a CCD camera. The diffracted image is “background free” because the nominally uniform background is not recorded. The real-time character of the holographic film makes it possible to interrogate tissue interactively by viewing on a video monitor, or enables high voxel-rate recording to capture relatively large tissue volumes to computer. The real-time character also makes it adaptive and enables it to compensate mechanical motions in the optical system. This chapter gives an overview of the principles of holographic OCI. It begins with a description of holography as spatial heterodyne detection, and continues with the origin and role of speckle in multichannel illumination of tissue, the development of the technology, its sensitivity and dynamic range, and the current state of the art. The introductory sections describe the advantages of direct imaging (without computed reconstruction), the ability to perform Fourier optical imaging, and the role of speckle and statistical optics. Image-domain holography (IDH) and Fourier-domain holography (FDH) are described, and the better performance of FDH (that brings the system sensitivity to nearly – 100 dB) is explained. Holography in the Fourier domain also has the capability for phase-contrast imaging that can acquire small sub-wavelength surface relief despite long coherence length. Phase contrast coherence-domain imaging can detect long-range spatial structure that is invisible to point-scanning TD-OCT.